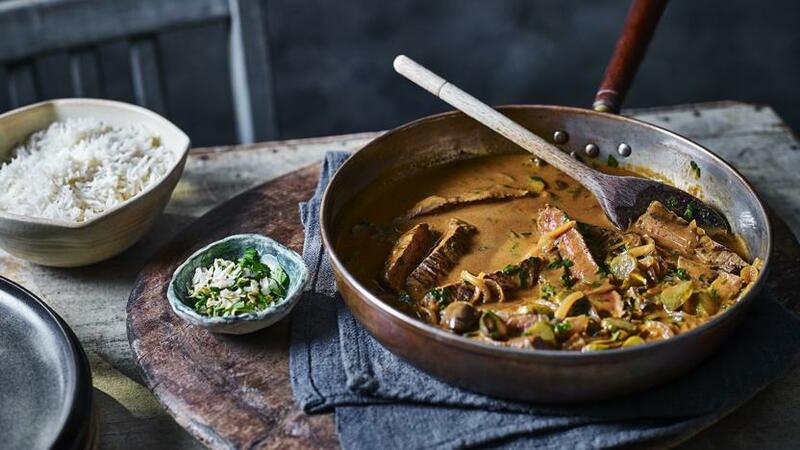 This classic creamy beef stroganoff is made with mushrooms, smoked paprika and slices of pan-fried rump steak. It is also still filling without the rice, should you want to reduce the calorie count. Each serving provides 795 kcal (505 kcal without rice), 59g protein, 87g carbohydrates (of which 18g sugars), 18g fat (of which 7.5g saturates), 18g fibre and 4.5g salt. Heat the light olive oil in a large frying pan over a low–medium heat. Add the onion and cook gently for 10 minutes, or until softened and starting to caramelise. Stir in the garlic and cook gently for 2 minutes. Crumble in the stock cube and stir in the paprika and tomato purée. Cook, stirring, for 2 minutes. Add the beef consommé, mushrooms and mustard. Bring to the boil then lower the heat and simmer for 10–15 minutes, or until the volume of liquid has reduced by half. Meanwhile, place a griddle pan over a high heat. Bash the steaks between two sheets of cling film, until about 5mm/¼in thick. Spray each side with six sprays of oil and season with salt and pepper. When the griddle is smoking hot, add the steaks and cook for 1 minute on each side. Remove and set aside to rest. Once the sauce has reduced, remove from the heat and stir through the cornichons, crème fraîche, and most of the parsley and chervil (reserving some for garnishing). Stir in the juices from the resting meat and check the seasoning. Cut the meat into thick slices and stir into the sauce. Mix together the dried onion flakes and reserved chopped parsley and chervil. Serve the stroganoff sprinkled with the onion and herb mix, with the rice on the side, if you like.